February 28, 1861 – The Colorado Territory is carved out from portions of what was previously the Kansas, Nebraska, New Mexico, and Utah Territories. That autumn, the First Territorial Assembly selected Colorado City, a spot on the open prairie near Pikes Peak and close to the center of the new territory, as the territorial capitol. In 1862, the first and last territorial meeting was held in Colorado City. The lack of accommodations and provisions for the twenty-two members of the Assembly caused them to adjourn and reconvene in Denver City. There, the Assembly promptly named Golden City as the territorial capital. Since the Assembly also, at times, met in Denver instead of Golden, Colorado’s seat of government actually alternated between Denver and Golden between 1863 and 1867. Moving territorial meetings and carting wagon loads of official property (tables, benches, and gunny sacks of archives) from location to location eventually grew tiresome, so in December 1867 the Seventh Territorial Assembly passed an act making Denver the capital city. Territorial Governor Alexander Hunt sent out a call for a land donation and received several offers. In January 1868, Hunt’s Capitol Commission accepted Henry C. Brown’s ten-acre-land donation, located less than a mile from the center of the frontier town. The out-of-pocket value of this donation was about $12.50, but for Mr. Brown it was a shrewd investment in the future value of the rest of his 160 acres surrounding the proposed capitol building and grounds. Could this be Colorado’s first public-private partnership endeavor? It would be 18 years before construction on a capitol building would start and then another 20 years before it was considered finished. Mr. Brown, however, immediately began developing the area around the future capitol’s location, known as “Brown’s Bluff,” with brownstone mansions. Many initially dismissed Brown’s Bluff as being too far from the center of town, but soon Denver’s wealthier families began to leave the commercial building construction and congestion of the growing “inner city” to move to the quieter and more picturesque “Capitol Hill” area near the site of the future capitol building. 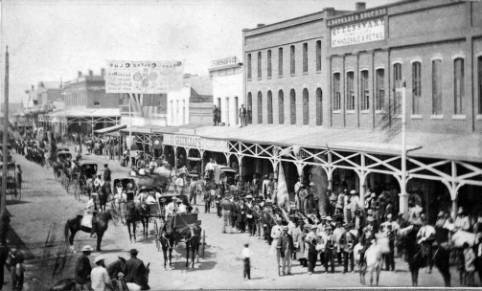 Meanwhile, the Territorial Assembly continued to meet in rented rooms and warehouses along Larimer Street and the territorial governor held office in the Larimer Street Barclay Building/Hotel. 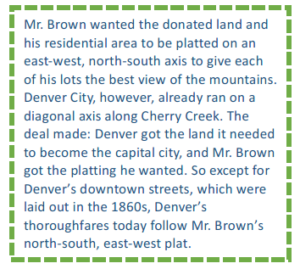 In 1875, there still was no sign of any construction on Mr. Brown’s donated land, and now that Colorado was actively campaigning for statehood, a reason to wait. A state capitol city would need to be chosen after statehood was attained, and there was no guarantee that Denver would become that state capital, so the land remained an open field. In 1876, Colorado, known as the “Centennial State,” became the 38th state to join the union, but the public vote on the state capital city would not be held for another five years. In 1879, having given up hope on the construction of a Denver capitol building and needing the $50,000 his donation was now worth, Mr. Brown launched a legal battle to reclaim his land. On November 8, 1881, after counting the 45,497 votes cast, Denver was elected Colorado’s capital city. Two years later, the legislature passed an act to build the Colorado State Capitol and appointed a “Board of Capitol Managers” to oversee the task, even though the legal battle for the land remained unsettled. The legal battle dragged on for seven years, making its way to the Colorado Supreme Court in 1881 and the United States Supreme Court twice. Each time the high courts ruled for Colorado; the last U.S. Supreme Court ruling in 1886 was final. Construction commenced the summer of 1886 with the state of Colorado barely ten years old and the log cabins and wood plank sidewalks from the gold rush days still lining the banks of Cherry Creek. 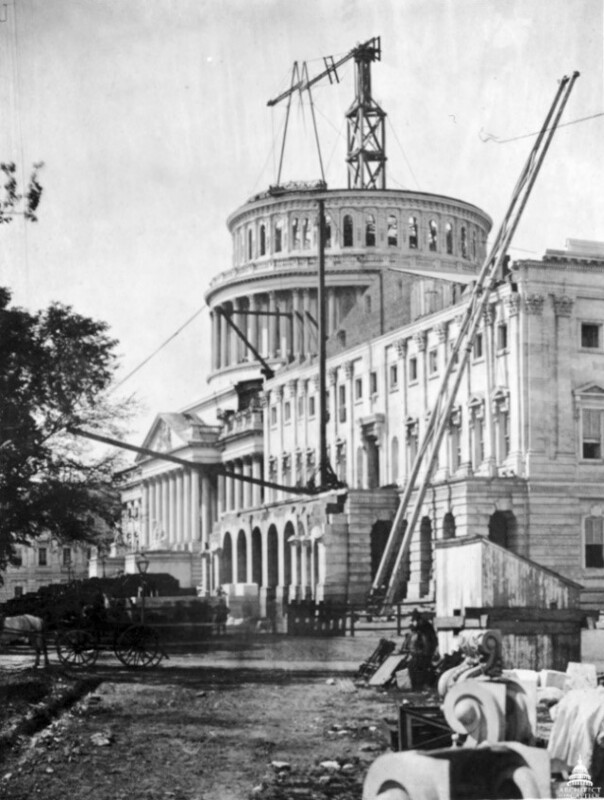 The construction on a capitol building “large enough to house the state government far into the future” ended in 1908 when gold plating replaced the original copper plating on the dome. Colorado state government continued to grow with new agencies and additional employees and soon needed more office space than the capitol building could accommodate. By 1915 construction on additional state office buildings along Colfax and Fourteenth Street started. Colorado is grateful to Mr. Brown for his generous donation that laid the foundation for its beautiful Capitol and grounds. Mr. Brown’s Attic is a public museum/gallery located between the Capitol’s third floor and dome dedicated to the history of the building he made possible and an ongoing tribute to the man who made it possible. 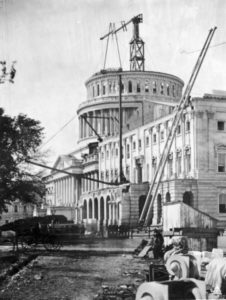 Its photographs, displays, and artifacts tell the Capitol’s story from its beginning as a field of grass to the present day. Henry Cordes Brown, born in Ohio in 1820, was the 19th of 20 children. He was orphaned when he was seven years old and worked at a nearby farm until he was 16. He then learned the carpentry trade and later worked as a carpenter with an older brother in St. Louis, Mo., for several years before heading west to California where he continued to work as an architect, builder and carpenter. No stranger to hardship, Mr. Brown was a self-made man several times over. While in California, the banking crash and economic panic of 1854 cost Mr. Brown his life savings of $50,000. He simply went back to work and soon saved $6,000, and in 1857, sailed for Callao, Peru, for a shipping business venture only to return to St. Louis in 1858 with sixty cents in his pocket. Resuming his carpentry trade, he earned money for another journey west to California, this time with his new wife and young son. In 1860, they arrived in Denver and decided to remain there. He was able to obtain wealth and status through building contracts and other land and mine operations. 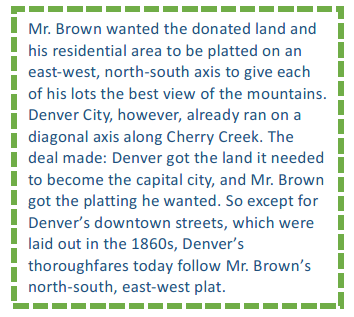 In 1863, he claimed 160 acres, known as “Brown’s Addition” just outside of the frontier town of Denver. Most famous for building The Brown Palace Hotel, Mr. Brown also owned the Denver Daily Tribune for three years and was a charter member of the Denver Board of Trade, the first business organization in the city, which later became the Denver Metro Chamber of Commerce. He helped bring the Denver Pacific Railroad to Denver, co-established the Bank of Denver, and was involved in establishing the Denver City Library. Mr. Brown made a fortune from real estate development and his other land holdings until the global economic panic of the 1870s nearly destroyed him financially. He was forced to sell his home and estate for $50,000, but he somehow recovered and by 1880 was worth nearly five million dollars, making him one of the wealthiest men in Colorado. Twenty years later and only one year after opening the doors of The Brown Palace Hotel, the Silver Panic of 1893 hit Colorado, robbing Mr. Brown of his fortune one last time. Unable to pay his debts, he sold The Brown Palace Hotel and retired to California. Mr. Brown died in March 1906 at a hotel in San Diego, Calif. His body was returned to Denver to lay in state in the Rotunda of the State Capitol, allowing Coloradans to honor and pay tribute to the man who helped make it possible. He is buried in Denver’s Fairmount Cemetery. Previous Post: Does the “Masterpiece Cakeshop” decision affect free speech, freedom of religious expression, and civil rights protections for protected classes?